I got a plastic lid thing in her poop spot just waitin for some action. One step at a time. Let’s see if she begins using the warm hide after you switch it to the more secure hide. Does she look ever thin to you? it looks good, how warm is the moist hide? could you get pics of all the hides? if she doesn't feel safe in them then she won't use them. ... or I'd link you to Elizabeth Freer 's feeding guide. 12:10 AM - Elizabeth Freer mentioned acpart in post Think I'm getting close to having some eggs! 01:50 AM - Geopard Lecko mentioned Elizabeth Freer in post I've got dubias! 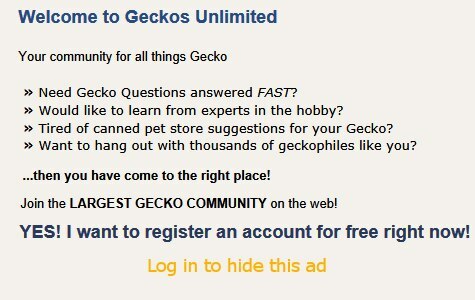 12:24 AM - Geopard Lecko mentioned Elizabeth Freer in post First Leopard Gecko 9 Days Later 2 Eggs. Whoa! 03:39 AM - Geopard Lecko mentioned Elizabeth Freer in post Made my own hatchling rack + got some supplies and an incubator! 09:37 PM - Geopard Lecko mentioned Elizabeth Freer in post How would you do it? 08:05 PM - Geopard Lecko mentioned Elizabeth Freer in post How would you do it? 01:51 PM - Geopard Lecko mentioned Elizabeth Freer in post How would you do it? ...me over there lol! Elizabeth Freer what do you think? 03:15 PM - Elizabeth Freer mentioned acpart in post Questions on keeping and feeding Lygodactylus Williamsi. 03:07 PM - Elizabeth Freer mentioned acpart in post Questions on keeping and feeding Lygodactylus Williamsi. 07:40 AM - Newbreeder tagged Elizabeth Freer in thread Say hello to my first ever hatchling! 11:50 PM - Yoinks tagged Elizabeth Freer in thread Leopard Gecko, refusing to eat or just picky? 06:09 PM - Sphinx tagged Elizabeth Freer in thread Worried about my leo, possible parasite?